I see beauty in the soi - I went for a walk around bangrak streets this evening. it's still so hot & humid 6-7pm, but there's so many things to see. I'm not the best photographer, and my camera is not that good at colours, so they've come out more muted than they really are, and it doesn't focus well in low light - especially when zoomed - but here's a photo slideshow of some of the buildings and people in the soi. a couple of times I could hear people talking and looking - like the motor-soi drivers who sit on the corner, so I snapped a quick shot and kept walking past. there's also lots of very small and scrawny street cats. I love the colours and textures of the buildings - and the windows - I can imagine people looking out of the windows to see what's happening in their neighbourhoods - though I think they also seem to spend a lot of time outside, on the streets/soi, eating at the food stalls and talking with friends. it's nice. tonight's taxi driver got a little lost - we ended up on the wrong side of a split one way road and he couldn't find a place to turn, so we did a loop of the back streets / soi. I can't remember the name of the street nearby - at first I thought it was charoen may but it might be (thanon) charoen chan?? not too far from (thanon) charoen krung anyway, if you take an earlier exit off the highway and end up in turning sai (left) instead of qua (right) to get to charoen krung (there was a sign but we were in totally wrong lane by then. anyway, it was great to be lost - I just love the soi! (small streets / lanes) there's so much activity - people getting their hair done at the local hairdresser, people eating at one of the many street stalls, people waiting for the bus, people at the stores - working, visiting or shopping, people just sitting out on the street / stoops talking or watching the cars and motor-soi drive/ride past. the tuk tuks. the motor soi waiting on the corner with their coloured flouro jackets and motorbikes - they're like a single person taxi on a motorbike. people at the fruit stalls. I saw a durian store and a man about to cut a durian open. 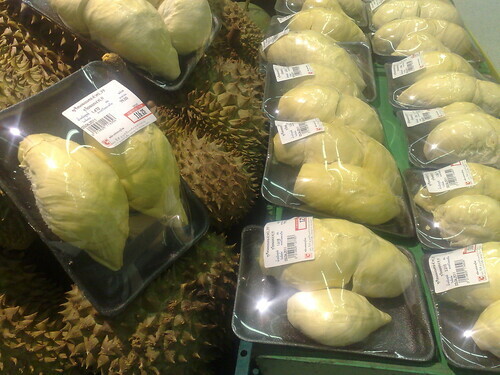 I'd bought and tried a durian earlier today after we went for lunch (great pad thai too!) - it was in my bag. I could still smell it - it was intoxicating in a way - the tangyness of it is really striking, though the texture is really smooth - sort of like a hard banana texture, but the taste is sweet - I kept thinking of dragon fruit punch (though perhaps that's not the right smell / taste also - have forgotten my words again). not sure if the taxi driver liked the smell of durian - I could hear him sniffing every so often. the smell changed during the evening, I couldn't eat all of it, but I had some more after dinner. it's in the minibar fridge now so the room smells less of durian. apparently it's banned on some public transport and hotels because of the smell. I've tried many Thai fruits now - most from this Thai fruits page that one of the guys from work had sent me - they've been sooo generous at work, especially with food. once I commented to one of the guys that they had a lot of food, and chats at work with food (usually at the end of the day or lunchtime), and he replied, "yes. happiness is most important" which I thought was a fantastic attitude! work pays for the food - apparently it makes the programmers work better in the afternoons. I'd say they're probably right - maybe more places should do this - it's quite common in Asia (so I've noticed) for work to provide food at the workplace.